Attention : Facebook made breaking changes after 1st may,2018 regarding app review. For more details read "getting access token" section. (i) Open your module from module manager.under 'module settings' tab select the view from radio button list. view go to 'Comments view settings' tab to configure). Read the quick start documentation - here to know details about most important settings. 'page_id' and you will see 'page_id=34343434' somewhere, so your page id is that 34343434. Always verify it's your page by loading page url putting page id in browser as follows - https://www.facebook.com/34343434/. load your group.your group page url look like as https://www.facebook.com/groups/343432222/ where 343432222 is the id. Displaying profile feed will not be good because of lots of restrictions and privacy, but still you can display lots of public posts and activities. login to your facebook account, go to profile page your profile id will look like below ( example - mridulcs ) or use this tool to get id. If you created facebook application after 30th April 2014 and using it's token to display feed then you have to get profile id in a diffrent way under your new application, contact for how. (iii) Finally in 3rd step you will be asked to enter FB page id in numbers(at this step you can see generated user token in the input box), if you enter page id and click submit then you will see your page access token in response which is shown below as a example. 4. 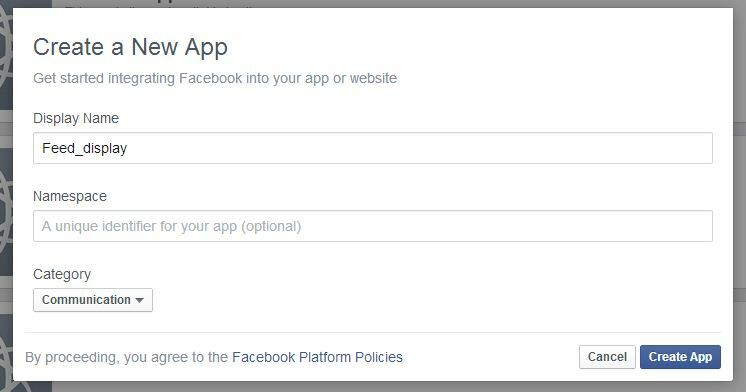 If you are displaying a Facebook group posts then you can either use a application token or page access token or user token. To generate page access token follow steps written in step-3 above. To generate user token follow step-3 above again(you will see user token in final step, FYI user token expires in every 2 months). To generate application token go to this token generation link here( this link is for a wordpress plugin but you can use it to generate app token entering app id and secret key). FYI page and app tokens don't expire. zip program available for free here http://www.win-rar.com/download.html & afterwards extract the extension zip with winrar. ii) if you ever get access token related errors then generate access token by setting "Generate access token" view under "Module view settings" tab in module settings page in admin side of your website. Access token will expire if you change something in your account setting(ex: password).so you will need to generate token again. these kind of violations written indirectly in policy. appear instead profile picture.Likewise find out other restrictions you set for which this kind of problems appearing until it's solved. viii) How you get post id to filter posts by post id? click the date on any post in facebook then it will be loaded as a single post in FB, there look for the post id in the url in numbers. In case of page post sometimes thare are multiple ids in the url, look for ""story_fbid" value. FB may change things in future, use google to get post id.